Deirdre leads her trio at two North London local gigs. Yes, the thrill is gone – I’m sorry, I’ll read that again. The grill is on, for some great food and a mix of some beautiful originals and standards. 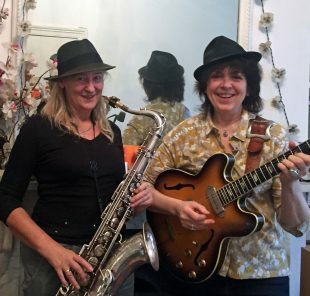 Fri 14 Nov Jan’s Bar, N16 Deirdre Cartwright Trio with Diane McLoughlin guesting on sax. 8.30pm for a seat. Calling Nottingham! 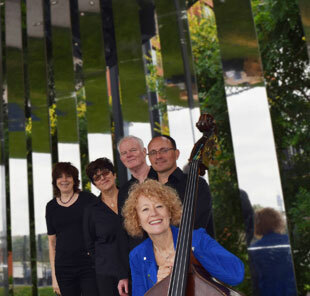 Alison Rayner steps out from behind the double bass to lead her super combo ARQ. They’re all packing into the Ford Transit and steaming up the M1 to JazzTrane. 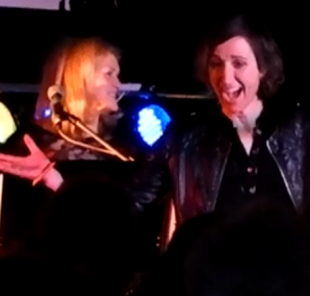 Our tour gigs have been such fun with the group really opening out and making the most of Alison’s great compositions. Let your friends in Nottingham know about this. 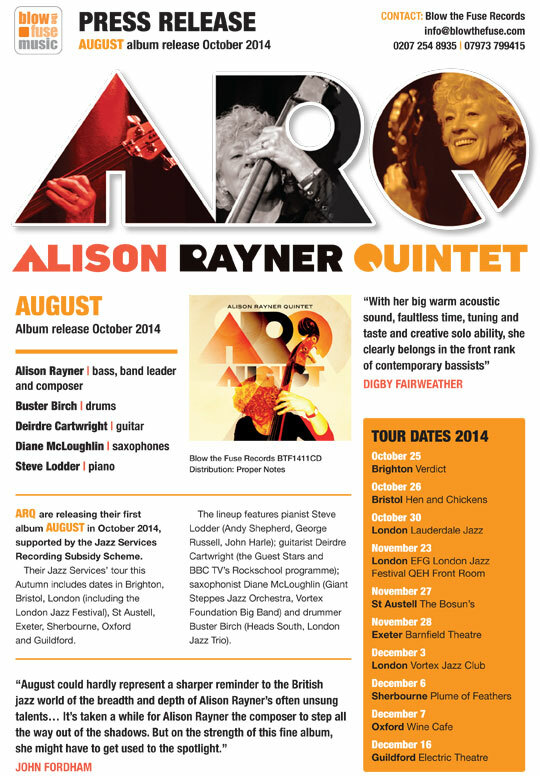 If you’re not on the ARQ tour lines or have missed the London gigs; why not buy the new CD? OK here’s the BIG WEEKEND. Friday 21 November Vocal jazz legend Norma Winstone MBE with Nikki Iles and Mark Lockheart and support from Emily Remembered. One of the UK’s most celebrated singers, Norma Winstone is performing at St Mary’s Old Church in Stoke Newington. 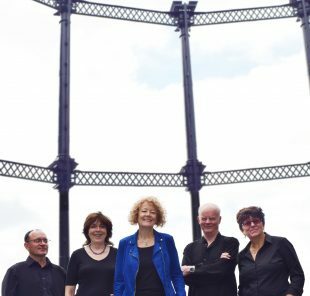 Part of the EFG London Jazz Festival 2014, this will be a memorable concert set in the candlelit medieval church and filmed for Mezzo/Arte Euro TV channels. 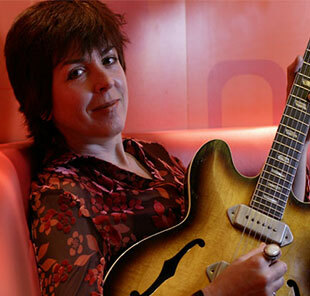 Emily Remembered: Deirdre Cartwright, Kathy Dyson guitars with Sarah P vocal. Doors 7.45pm Lovely bar drinks at reasonable prices but no food. Sunday 23 November Front Room, Queen Elizabeth Hall, South Bank Centre. Free all afternoon. 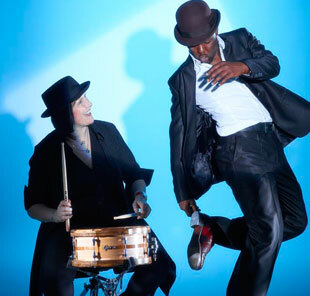 12.45 Panel discussion Jazz & Gender with Professor George McKay, Deirdre Cartwright, Gary Crosby OBE and Roz Harding. Christine Tobin, Phil Robson, LUND, Kim Wei, Annie Whitehead, Jennifer Maidman and Ruby Thompson. Hosted by Sarah P but we’ve run out of space. Just time to flag up LOOK MUMMY LOOK…. 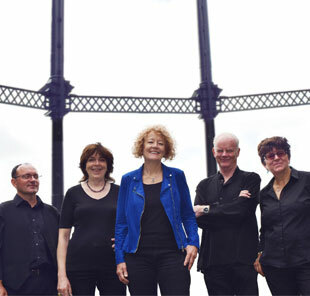 Friday 19th December one of London’s best live groups THE ELECTRIC LANDLADIES return to Chats Palace. Buy one get one half price cocktails and beers before 9.00pm and lovely food and cakes! St Mary’s Old Church, Stoke Newington Church St N16 Norma Winstone with Nikki Iles and Mark Lockheart. 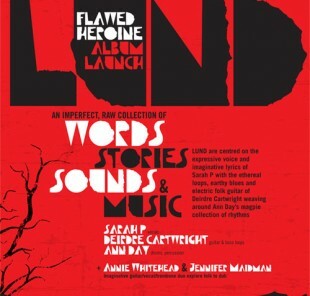 Plus Emily Remembered: Deirdre Cartwright, Kathy Dyson and guest vocal from Sarah P.
We’ve programmed the QEH front room stage. 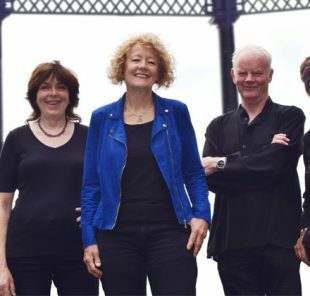 Bands are Chelsea Carmichael Quartet, Deirdre Cartwright/Baluji Shrivastavar ensemble, Roz Harding’s Wave and Alison Rayner’s ARQ. Music begins 2 pm and continues all afternoon til 7pm. Great atmosphere and it’s free. What lovely audiences and great response to the new album tunes. Really looking forward to the official launch in October 2014. 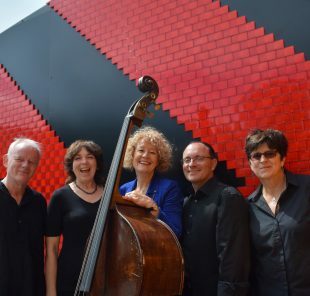 ARQ A winner of the Jazz Services Recording Subsidy Award for 2013, bass player and composer Alison Rayner leads this contemporary jazz quintet. Plus Flo Moore’s Element with Ralph Wyld and Rod Oughton. Great gig last night in St Mary’s old church with Annie Whitehead playing her socks off! We were once again sold out. The 22 piece world music workshop big band played a terrific set, numbers from Bhundu Boys, Don Drummond and some great original arrangements. Annie’s quartet featured the groove of Jennifer Maidman and Liam Genocky and the fluid lines of Steve Lodder. We’ll be back at the old church in the Autumn. 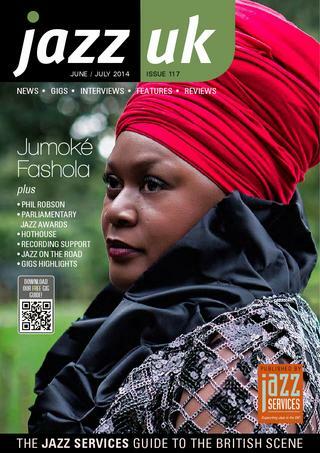 On Friday 13th of June 2014….. 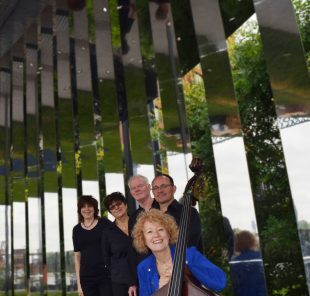 The last of our double bills at St Mary’s Old Church and we have world renowned trombone player Annie Whitehead leading her own quartet and also, for the first set, leading a 20 piece big band made up of many local musicians of all ages. This will be a fun and exuberant finale to our St Mary’s season. with Steve Lodder keyboards, Jennifer Maidman bass, Liam Genockey drums. World Music Workshop Big Band. 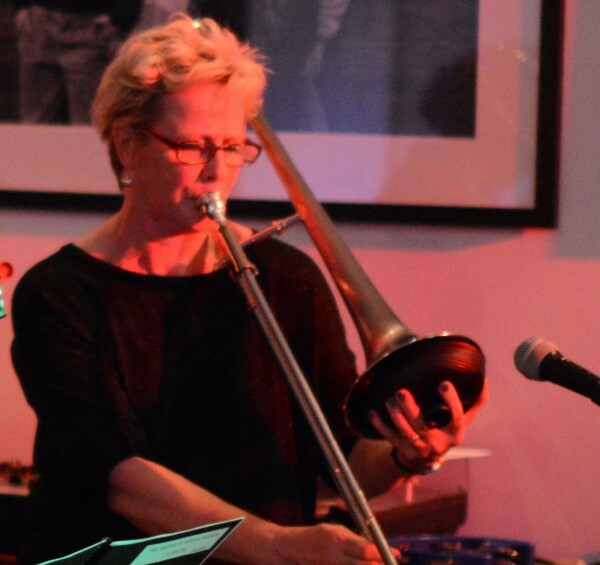 An exciting blend of music from twenty horns, featuring jazz, african and latin grooves, under the leadership of Annie Whitehead. 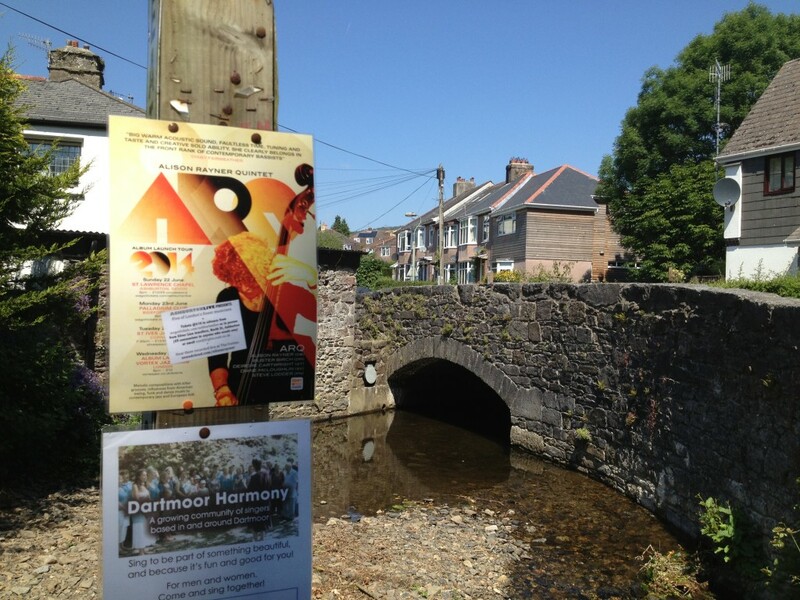 Repertoire includes tunes by Chris McGregor, Dudu Pukwana, Duke Ellington and Diane McLoughlin. We’re feeling so excited about our 25th year party that we’ll be pouring glasses of champagne FREE to the first 25 people who arrive at the Vortex. Doors will open at 8pm, it will be a very busy night so do book your tickets – or arrive early, pay on the door and have a champagne start to the evening. Lovely rehearsal with Louise and Mervyn, great South African and Latin influenced tunes, Ruby and Josefina all set. 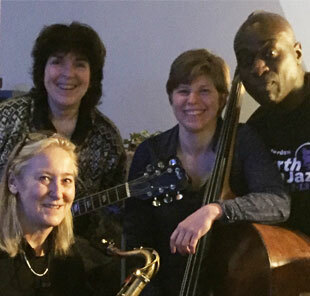 Join us for an evening of exuberant playing, Latin and African influences mixed with blues and jazz, older excerpts from Guest Stars days, shiny new songs from Ruby Thompson and very special guest Mervyn Afrika. 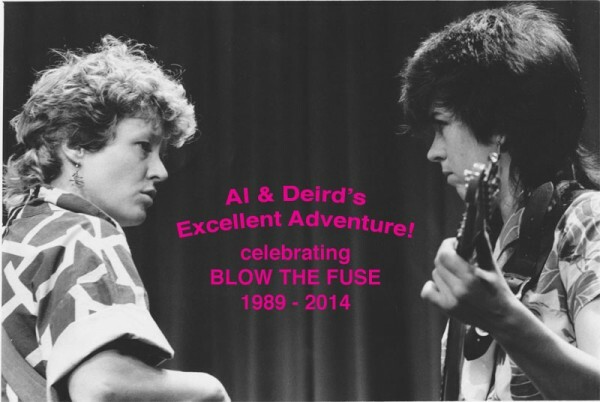 Come and help us as we celebrate the first TWENTY FIVE YEARS of Blow the Fuse! We look back, we peer forward…. Blow the Fuse celebrates 25 years. and we have the musicians from our very first night in 1989! 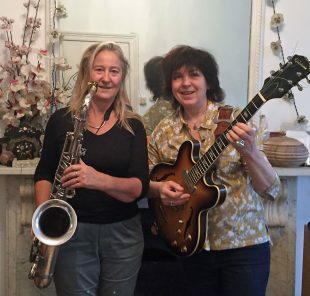 Louise Elliott sax/flute & Cheryl Alleyne drums. 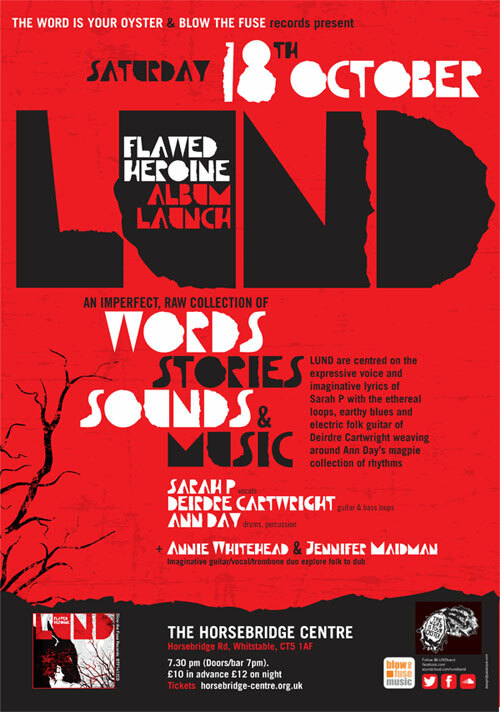 Hosting, toasting and playing – Deirdre Cartwright and Alison Rayner. Louise Elliott virtuoso flute and sax player has played regularly with Grand Union, Penny Rimbaud and Yusuf Ali Khan. Cheryl Alleyne Studied Jazz and Classical music at the College of Arts & Technology and then returned to London where she worked with Loose Tubes, The Jazz Warriors and rap/hip-hop group ‘Us3’. Mervyn Afrika has been one of the great names of South African jazz for the last 30 years. He creates sumptuous piano improvisation and composition drawing from his rich cultural and musical background. Josefina Cupido is a charismatic vocalist and percussionist with a unique voice that sits between Phoebe Snow and cante flamenco. 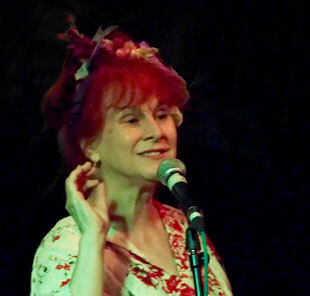 Ruby Thompson will be singing with guitar, piano, ukulele and a paper cup!